Citron Shawlette, a photo by Pointe Shoes Punk Rock And Purl Pix on Flickr. OK. Yup. I admit it. Got the attention span of a goldfish :). So, I was running errands Sunday and my route took me past my LYS, Yarn Forward. My GF Francine – Francine of “Fancy That” shawl pins – was working, so an impromptu “Sit ‘N Knit” ensued. I couldn’t knit the sundries I picked up, so allowed myself to be talked into a skein of Noro Sekku – yummy! – and sat down to start “Citron“. In fairness, “Citron” WAS queued on Ravelry… I am… following through… ;-). I’ve been knitting on the bus and into the wee hours, it’s so addictive and easy! A beginner with skillz could do this. 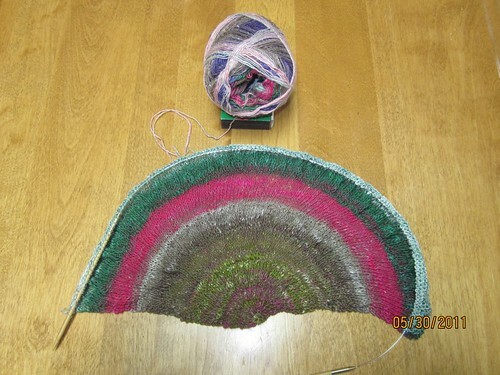 This entry was posted in Knitting, Scaves and Cowls and tagged Fancy That, WIP's 2011. Bookmark the permalink.